When we get sick, it is fairly common to look to others’ experiences to make sense of what ailment we have, where we got it, and when we might recover. The interesting thing about the 1600s is that women made these sorts of comparisons more frequently than men. There are several explanations for this pattern, which I explore in my book, Ill Composed: Sickness, Gender, and Belief in Early Modern England (Yale University Press, 2015). The explanation I want to discuss here involves recipes (of course!). And that’s because recipes taught users to compare themselves to other people. Image credit: Wellcome Library, London, Lady Ann Fanshawe, Recipe Book, MS 7113. We also see Fanshawe’s own name, which suggests that she tested her recipes to see whether they were worthwhile. As Elaine Leong has discussed in another post, Fanshawe crossed out the recipes that didn’t work. Some women noted others’ experiences alongside recipes in even more explicit ways. 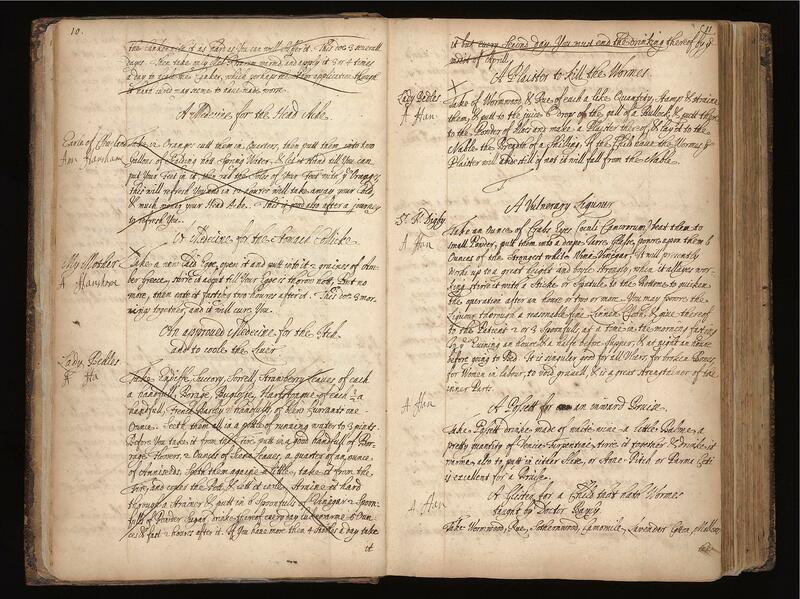 Writing in 1674 in a book now held at the Folger Shakespeare Library (MS V.a. 215), Susannah Packe included the following note below a cure for convulsions: “Approved by Ma:Sa: for all her Children was very successful.” Assigning authorship or naming someone who benefited from a recipe proved its worth, and also provided a way for readers to evaluate their own conditions. Packe and Fanshawe compared their own experiences to those of the men and women listed in the margins of their books. When Elizabeth Hastings learned that her sister-in-law was sick in 1731, she penned a letter almost entirely devoted to the healing properties of snail water. This letter is now housed at the Huntington Library in California (HA 4741). She included a receipt for preparing the water, which is now lost, but may have involved distilling a pasty mixture of crushed snails, milk, mint, nutmeg, and dates. She also included directions for using the water (one spoonful taken with two to three spoonfuls of spa water) and even sent a bottle in the post so that her sister-in-law could “make a tryale of it.” She also listed people she knew who found the snail water useful. “Lady Ramsden from whom I had it has known surprizing Cases in Wastings of the Flesh,” she wrote. Also, “my Sister Ann’s servant Mrs. Dove is one instance who I believe would not have been now alive but for it.” This communal production, circulation, and validation of medical knowledge taught women to assess their bodies by looking to the words and experiences of others. Why did women look to others to evaluate their ailing bodies more frequently than men? Recipes were not an all-female genre of writing, after all. Men wrote and collected them too. Recipes, however, are one of the only forms of medical writing in the period that substantial numbers of women authored. While men documented medical matters in all kinds of genres of writing, such as casebooks and treatises, recipes were the prime mode by which literate early modern women recorded and shared medical information. Perhaps, then, recipes helped teach women in early modern England to look to others’ bodies as a way of better assessing their own. 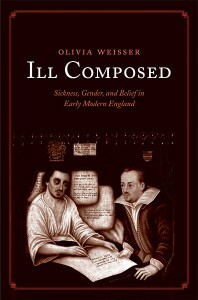 For more about gender, illness, and healthcare in early modern England, check out Olivia’s book: Ill Composed: Sickness, Gender, and Belief in Early Modern England. Close your eyes and imagine a chicken. Now a duck. Now a turkey. If this little experiment has worked the way I envisioned, when you thought of a pigeon you didn’t just think of a different bird but of a different environment. You likely pictured chickens and ducks and turkeys on a farm or in a natural setting (if not on your table). We think of pigeons, however, as urban birds, mobbing together wherever large numbers of people congregate. Some even see them as “flying rats,” nuisances that spread pestilence wherever they go (see this article for an example of the lengths cities will go to in order to control pigeon populations). It was not always thus, however. In the early modern period and before, pigeons were highly valued birds. They were good for carrying messages and for eating, but the pigeon was also highly symbolic, representing grace, lightness, and spiritual flight. The pigeon does, after all, belong to the same family (Columbidae) as the dove, symbol of the Holy Spirit. Indeed, pigeons were so prized that the right to keep them was reserved for monasteries and estates . Pigeons were also often used in medieval and early modern medical recipes. The recipes usually involved pigeon dung, but I have also found a sub-strata of recipes utilizing pigeon blood to treat something called the “stroke of the eye.” Given the description in these recipes, I conjecture that the “stroke” referenced is subconjuctival hemorrhage or, put simply, a broken blood vessel in the eye. This sort of ocular bleeding can occur from trauma or just simply from sneezing or coughing too hard. It is seldom painful. However disturbing the sight of this condition, however, the remedy was sure to be worse. In this anonymous medical manuscript of 1663 (Wellcome Collection MS.6812/26), for example, we are instructed to slit the vein on the wing of a pigeon and allow the blood to spurt into the patient’s eye. Take a pidgeon and let hi[m] blood in one of the winges in the vein & let the blood spinne out of the veine into the eye & it will helpe you yf you use it 5 or 6 tymes. Take a Pigeon, & let her blood in the great Veine of the Wing, & let the Blood Springe out of the Veine into the Patients Eye. You must dresse it 6 or 7 times. For A stroke in the Eyes if there Grow pain thereby or if you be pricked in ye Eyes by any thing. Take of pigion & let her blood in one of the veins of ye wing and let ye blood spin out of ye vein into ye eyes and it will by gods grace cure it this must be done 5 or 6 nights, at gooing to bed. In humoral medicine, birds were associated with blood, a sanguine temperament (hot, wet) and the element of air. 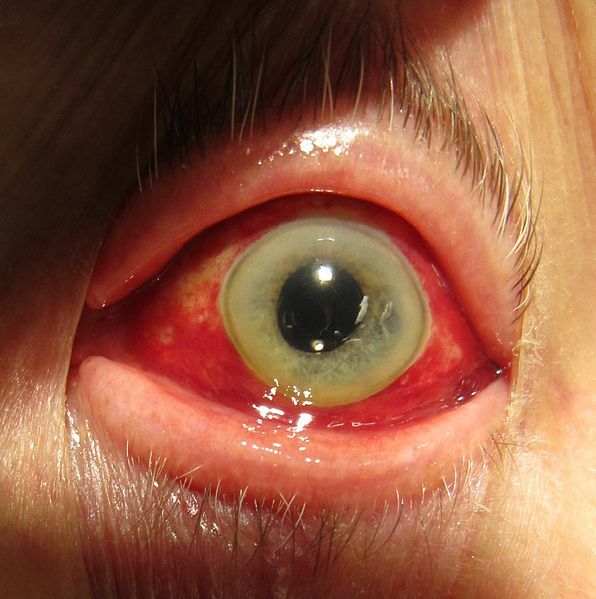 Because of this, we might surmise that a broken blood vessel—and the ensuing red eye—would signal an excess of blood to an early modern physician. The treatment, then, would be oppositional: the patient would need something cold, dry and earthy… like tree roots, leaves, or plants. Since the eye itself was considered to be a phlegmatic organ (cold and wet), the blood of the pigeon would balance the humors. Buttressing this idea is the recipes’ insistence that the blood be let from the wing of the bird: the seat of airy flight would be the perfect counterbalance to the watery mucus of the eye. But whatever the theoretical underpinnings of the use of pigeon’s blood to treat subconjunctival hemorrhage, the lived experience of having bird blood spurting into your eye must have been horrible. And, according to the recipes, it also would have been frequent: the directions, though short, are consistent in directing the patient to undergo the treatment between 5-7 times. By that time, the white of the eye would have returned to its healthy appearance. Of course, the eye would have returned to normal in about that time without the treatment, too. Which leads me to the conclusion that (c’mon, you know you were expecting this) . . . this treatment is for the birds. *I was pointed to this reference by a note by Michael Robinson in the online version of The Diary of Samuel Pepys. Exploring CPP 10a214: Who is “Me”? In her last post about our work with College of Physicians manuscript 10a214, Rebecca Laroche reported her discovery that the handwriting in the text’s early pages did not match that of a letter at the British library attributed to Calybute Downing . (06/08/2013) The mismatch at first led us to doubt whether the CPP manuscript note “probatum per me Cal. Downing” (24) could point to the mid-17th century divine Calybute Downing (1606–1644) as a compiler. The extreme clarity of the CPP manuscript’s italic hand, however, has raised for us the possibility that a scribe might have been involved in its production, thereby explaining the recipe book’s contrast with the British Library manuscript. The situation, however, raises a larger question: How confident can we be in identifying who a manuscript’s “me” is? In the case of the CPP’s “probatum per me Cal. Downing,” there initially seemed no reason to doubt that “me” is indeed Downing. But does that mean that Downing had to write “me” on the manuscript page himself? Other recipe books support the notion that a scribe may have put these words on the page for Downing, adopting his voice. Lady Anne Fanshawe’s book, for example, begins with this explicit note from a scribe: “Mrs: Fanshawes Booke of Receipts… written the eleventh day of December 1651. by Me Joseph Auerie”. This note changes the way readers interpret the collection. When readers turn the page, they see the beginning of a recipe “For Melancholy and heavenes of spiretts,” in Avery’s hand, attributed to “My Mother”; underneath that marginal note appears a second name, “A Fanshawe,” in what seems to be different script (4r). Wellcome Western Manuscript 7113, fol. 4r. But whose mother? 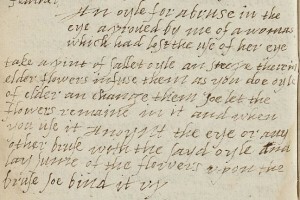 The phrasing suggests that Avery identifies the source from Anne Fanshawe’s viewpoint, or as she had written it down in a previous copy; the “my,” then, is likely Fanshawe’s even though her pen does not touch the paper. That raises the question, however, of who writes “A Fanshaw” as the second attribution. Luckily, page 2r offers an answer through another inscription (in a hand that matches the second attribution) which reads “K: Fanshawe. Given mee by my Mother March th 23. 1678.” In the volume’s opening, then, we have three instances or “me” or “my,” each pointing explicitly to a different person. Most importantly, these pages suggest a method of indicating explicitly who “me” and “my” refer to — within at least this portion of the manuscript. Yet Fanshawe’s manuscript is not always so explicit. The profusion of unidentified hands certainly contributes to this confusion, but it seems a tendency toward exact copying may be to blame as well. 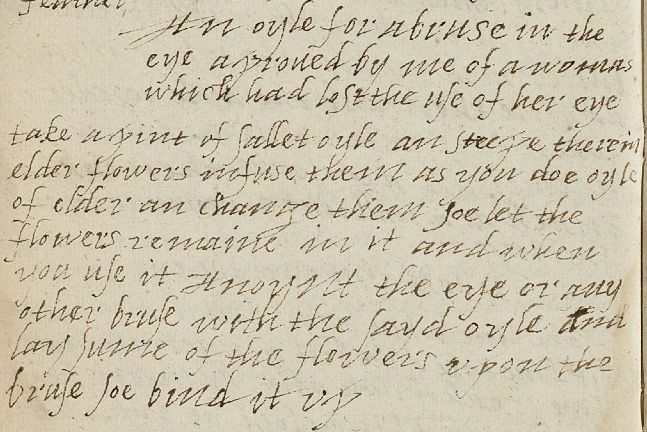 See, for example, Fanshawe manuscript’s “An Oile for a Bruise in ye Eye, or for any other bruise proved by Me of a woman, that had lost her Eye by a bruise, and recovered it againe” (30v). The “me” here could certainly be Anne Fanshawe, and the “lady who her lost her eye by a bruise” could be Lady Butler, whose name appears in the margin as an attribution. Then, the note in Katherine Fanshawe’s writing could be indicating that she associates the recipe with her mother. Wellcome Western Manuscript MS 774, fol. 88v. There is no Lady Butler here, and neither Fanshawe appears either. So who is the “me” to whom the recipe is recommended? The appearance of the same rhetoric in both appearances of the recipe – one certainly recorded by a scribe, and the other in a volume with multiple hands – makes determining this particular “me” a hazardous proposition. 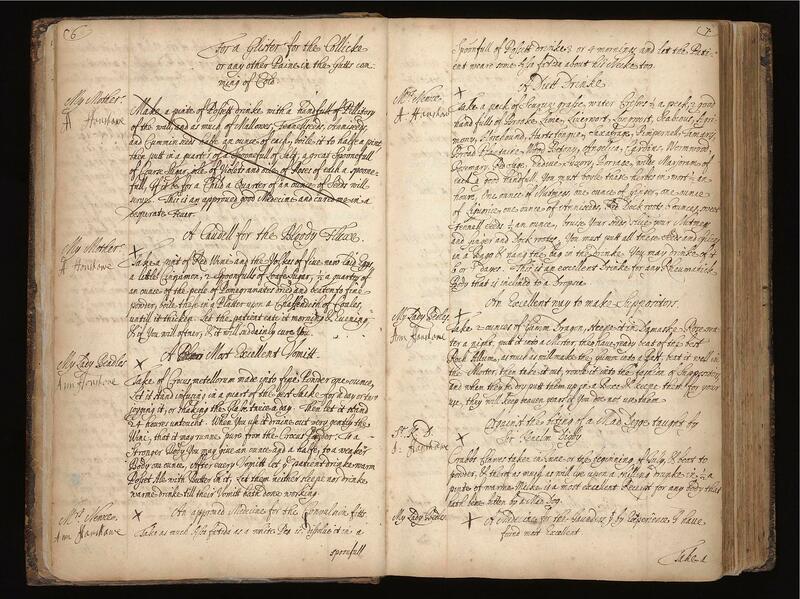 Conscientious copying of personal testimony, from a source that seems impossible to determine, thus obscures even more thoroughly the identity of the manuscript’s compiler, burying the “me” in multiple levels of vagary. The “me” in “probatum per me Cal. Downing” need not involve so many people. Luckily, it is the only instance of pronoun in the opening section of CPP 10a214. The seeming lack of other potential compilers in this section keeps the pool of potential referents narrow, allowing us to continue our investigation into which Calybutes could be involved in the manuscript’s creation. This is the seventh of a series of monthly posts on this topic. Other earlier blog entries on this topic appeared on 20/06/2013, 21/05/2013, 09/04/2013, 12/03/2013, 20/2/2013. http://archives.wellcomelibrary.org/recipebooks/MS7113/MS7113_0005.pdf. Elaine Leong blogged about the manuscript’s different compilers, the scribe and Fanshawe among them, on 11/09/2012. From the 1640s, recipes for chocolate drinks had been printed in English language books about chocolate; however, Hannah Woolley’s “To make Spanish Chaculata” in The Ladies Directory (1662) is, as far as I have been able to discern, the first in a printed cookbook in England. The fact that Woolley identifies this recipe specifically as “Spanish” is significant because she is clearly indicating its foreign provenance and attendant associations; yet, the recipe already shows signs of its acclimation to English taste. The call for water as the liquid component most closely associates Woolley’s recipe with those coming directly from Spain. Henry Stubbe, who published the chocolate tome, The Indian nectar, or, A discourse concerning chocolata, in 1662, explains the difference between Spanish and English Chocolate recipes: “Here in England we are not content with the plain Spanish way of mixing Chocolata with water.” Stubbe then relates that the English use milk and sometimes eggs or egg yolks to thicken the mixture. This instance in the Stubbe’s text (and borne out in Woolley’s recipe) reveals the necessity for each culture to naturalize the new commodity of chocolate to its own particular appetite and mode of assimilation. Many Spanish recipes also included spices, such as cloves, cinnamon, and long pepper (chili peppers), that would make the chocolate piquante, which would likely be too spicy for the English tongue. As Woolley adds egg yolks to the chocolate drink but excises any peppery spices, we can see how her recipe is altered for the English palate. No other recipe for chocolate appears to be published in any receipt book in English until Woolley’s prints her second one in the 1670 The Queen-Like Closet. 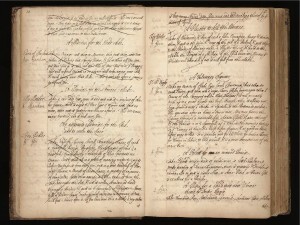 Anne Fanshawe’s cookbook manuscript, however, does contain a recipe titled, “To dresse Chocolatte,” with an annotation identifying the time and place as Madrid, 10 Aug. 1665. Most interestingly Fanshawe also includes a sewn-in drawing of an Indian chocolate pot and whisk or molinillo; on the drawing is written, “This is the same chocelary pottes that are mayd in the Indies.” As Anne was married to Richard Fanshawe, the English Ambassador to Spain, it is not surprising that she would have had access to a chocolate recipe and to the “Indian” utensils. The recipe, however, is scribbled out with a circular scrawl, making the recipe impossible to read. At the end of the recipe is a sentence that is not scratched out: “The Best Chocolate but that of ye Indies is in Sivill [Seville] Spane,” perhaps indicating that Fanshawe had gone to Seville and tasted what she thought of as superlative chocolate. Unfortunately, the recipe’s illegibility makes it impossible to know the ingredients or particular processes. 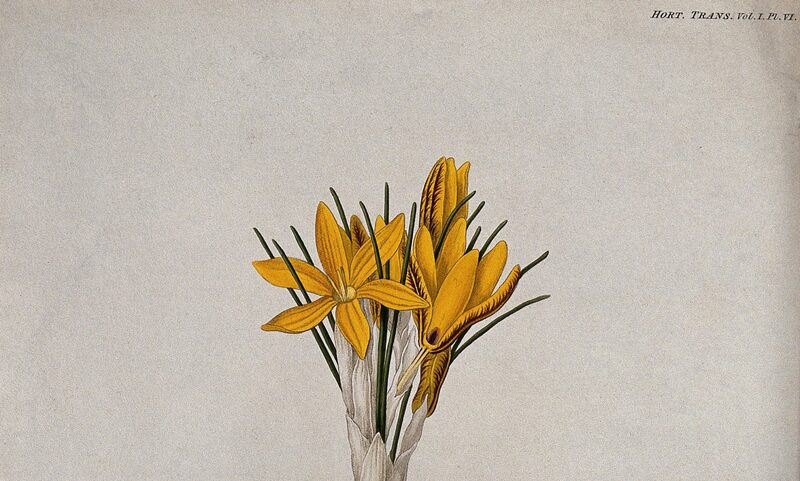 Nevertheless, even with its large lacuna, we can surmise from the peripheral clues that Fanshawe was actively involved in discovering new tastes and recipes from America; indeed she may have been the Englishwomen closest to the direct source of importation of exotic Indian kitchenware and comestibles into Europe. The lamentable scribbling, however, bars a comparison of Fanshawe’s and Woolley’s recipes, a comparison that might show the progression of English dissemination and/or adaptation of foreign recipes and exotic ingredients. This post is an excerpt from Amy L. Tigner, “Preserving Nature in Hannah Woolley’s The Queen-Like Closet; or Rich Cabinet” ” in Ecofeminist Approaches to Early Modernity, edited by Jennifer Munroe and Rebecca Laroche (Palgrave, 2011), p. 129-49. Hannah Woolley, The Ladies Directory in Choice Experiments and Curiosities (London: T.M. for Peter Dring, 1662). Henry Stubbe, The Indian Nectar: Or a Discourse Concerning Chocolata (London: J. C. for Andrew Crook, 1662), 109. Antonio Colmenero, A Curious Treatise of the Nature and Quality of Chocolate, trans. Diego de Vades-forte (London: J. Okes, 1640), 8. I would like to thank David Goldstein for pointing out Fanshawe’s receipt. Ann Fanshawe, “Mrs. 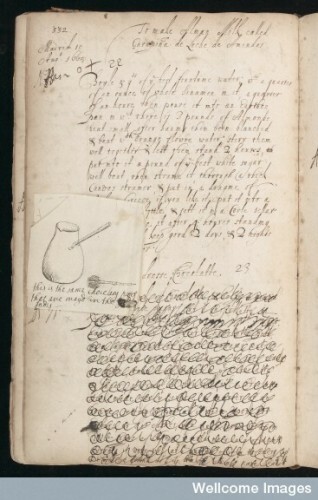 Fanshawes Booke of Receipts of Physickes, Salves, Waters, Cordialls, Preserves and Cookery,” MS7113 in Recipe Books Project (Wellcome Library, 1651), 332. Curiously, no other recipe in Fanshawe’s book has been so thoroughly obliterated; most others are simply crossed out with a big X over the whole recipe or a line is drawn through the words.